Share market highlights today: Sensex and Nifty closed Tuesday's trade lower, with Tata Motors shares plunging nearly 20% intra-day to seven-year low levels. The Indian rupee on Tuesday plunged to a fresh record low of 74.3538 against the US dollar. Share market live: The Sensex and Nifty closed Tuesday’s trade in the negative territory tracking weakness in the Indian rupee, along with higher crude prices and weak Asian markets. 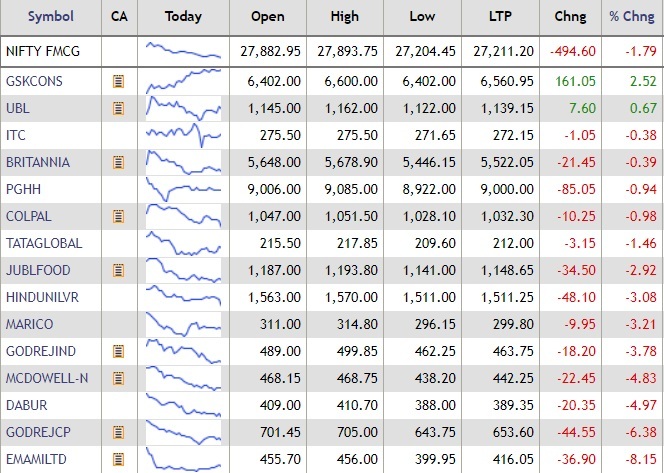 Heavy selling pressure in auto, FMCG, PSU banks and realty stocks, too, kept the domestic stock markets under pressure. The Indian rupee on Tuesday plunged to a fresh record low of 74.3538 against the US dollar. Tata Motors share price plunged nearly 20% to a seven-year low on Tuesday after its wholly owned subsidiary Jaguar Land Rover reported weak sales numbers in September. Tata Motors was the top drag on both the NSE and BSE in today’s trade. On the other hand, NBFC stocks gained today, with DHFL shares emerging as the top mid-cap gainers on the BSE. Adani Ports was the top gainer on the Sensex, followed by HDFC, Vedanta, Tata Steel, Coal India, Yes Bank, Sun Pharma, TCS, LT and Infosys shares. Asian shares hit 17-month lows on Tuesday as China allowed its currency to slip past a psychological bulwark amid sharp losses in domestic share markets, a shift that pressured other emerging currencies to depreciate to stay competitive, said a Reuters report. The NSE Nifty closed Tuesday's trade at 10,301.05 points, down 47 points or 0.45%. 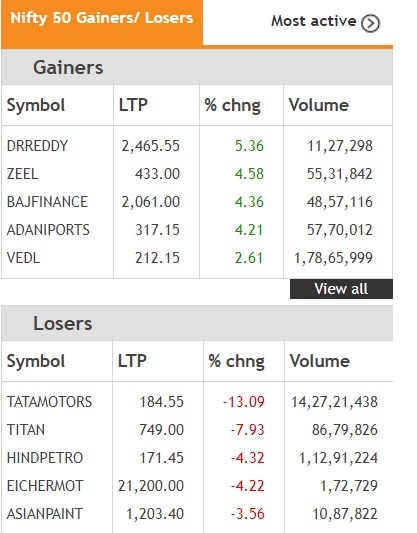 Here are the top 5 gainers and losers on the Nifty. The BSE Sensex closed Tuesday's trade 174.91 points or 0.51% lower at 34,299.47 points. The NSE Nifty closed at 10,301.05, down 47 points or 0.45% . The S&P BSE mid-cap index traded lower at 13,694.99 points, down 29.88 points or 0.22%. DHFL, IIFL, Reliance Infra were the top gainers on the mid-cap index, while Emami was the top loser. Europe battled to fend off a four-day losing streak for world stocks on Tuesday, after weary investors had seen Asia stumble to a 17-month low and bond markets hit by a fresh bout of selling, said a Reuters report. Strength in oil stocks on higher crude prices and a rise in banking stocks on increased global borrowing had initially lifted Europe's STOXX 600 index, but it was back near a 6-month low as the early momentum faded. Italy's benchmark 10-year government bond yield also moved towards a 4-1/2-year high as Economy Minister Giovanni Tria struck a resolute tone on his controversial budget plans in Rome's parliament. Tata Motors, Tata Motors DVR, Kotak Bank, Bharti Airtel, Blue Dart, Andhra Bank were among the trending stocks in trade today. Gold prices fell by Rs 220 to Rs 31,650 per 10 gram amid weakening global trend and easing demand from local jewellers at the bullion market Tuesday, reported PTI. Silver, too, remained weak and declined by Rs 50 per kg to Rs 39,250 per kg due to reduced offtake by industrial units and coin makers. In the national capital, gold of 99.9% and 99.5% purity lost Rs 220 each to Rs 31,650 and Rs 31,500 per 10 gram, respectively. The precious metal had fallen by Rs 30 yesterday. Sovereign gold, however, remained steady at Rs 24,600 per piece of 8 gram in restricted activity. Shares in China ended Tuesday mixed after wavering through the day on nagging concerns over growth prospects despite Beijing's steps to support the economy and contain the effects of an escalating trade war with the US, Reuters reported. The Shanghai Composite index ended 0.2% higher, having repeatedly dipped into the red. The blue-chip CSI300 index, in contrast, was unable to hold onto gains and ended 0.1% lower. The CSI300 financial sector sub-index ended down 0.2%, the consumer staples sector gained 1%, the real estate index lost 0.8% and the healthcare sub-index ended 0.1% lower. BREAKING NEWS: Rupee hits fresh record low! The Indian rupee hit a fresh record low of 74.2675 against the US dollar on Tuesday. On October 5, the rupee had crossed the 74/$ mark for the first time ever to scale a record low of 74.22 per US dollar. Earlier on Monday, the rupee slumped by 30 paise to finish at a fresh lifetime low of 74.07 against the US dollar, Bloomberg data showed. The Indian rupee traded at 74.2025 against the US dollar, just 2 paise away from its all-time record low of 74.2237 vs dollar. The rupee has fallen 2% in October and 16% in 2018. Oil prices rose on Tuesday as more evidence emerged that crude exports from Iran, OPEC's third-largest producer, are declining in the run-up to the re-imposition of U.S. sanctions and as a hurricane moved across the Gulf of Mexico, according to a Reuters report. Brent crude was up 45 cents, or 0.5%, at $84.36 a barrel by 0629 GMT, having fallen as low as $82.66 in the previous session before largely recovering. Brent hit a four-year high of $86.74 last week.U.S. West Texas Intermediate (WTI) crude futures rose 41 cents, or 0.5%, to $74.70 a barrel. NSE live: The Nifty FMCG index was trading lower during afternoon trade deals on Tuesday, with shares of Emami Ltd down over 8%. HUL, Marico and Dabur were trading with losses of up to 4%. Bharat Heavy Electricals has bagged four orders for emission control equipment from NTPC valued at about Rs 2,900 crore, said a Reuters report. The orders involve supply and installation of Flue Gas Desulphurization (FGD) systems for control of SOx emissions at NTPC's 3x660 MW North Karanpura, 2x500 MW Mauda Stage-I, 3x660 MW Barh Stage-I and 2x660 MW Barh Stage-II power projects, it added. Gold prices tumbled Rs 394 to Rs 31,249 per 10 grams in futures trade Tuesday as participants indulged in off-loading their exposure in line with a weak trend overseas amid profit-booking at prevailing levels, said a PTI report. In futures trade at the Multi Commodity Exchange, gold for delivery in December was trading sharply lower by Rs 394 or 1.25%, at Rs 31,249 per 10 grams in a business turnover of 9,586 lots. Analysts said besides profit-booking by traders at the existing level and weakness in precious metals, led to the fall in gold prices at futures trade here. Globally, gold fell 1.39$ to USD 1,187 an ounce in New York yesterday. 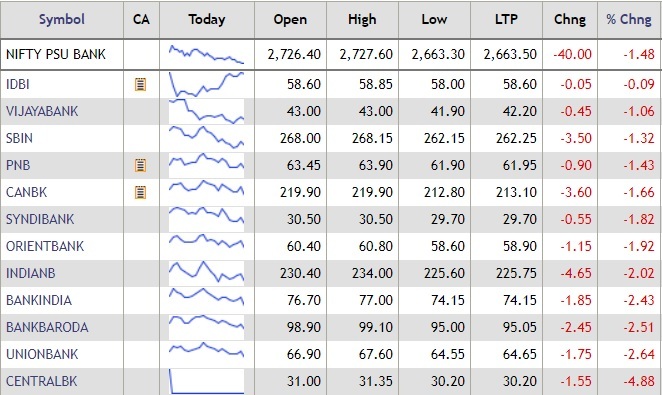 Nifty LIVE: The Nifty PSU Banks index traded in the red on Tuesday with shares of Central Bank, Union Bank, BoB, Bank of India and Indian Bank falling up to 4% on the index. SBI and PNB shares fell over 1% on the index. The Indian rupee was trading a paise lower at 74.08 per US dollar during late-morning trade deals on Tuesday. Earlier on Monday, the rupee slumped by 30 paise to finish at a fresh lifetime low of 74.07 against the US dollar, Bloomberg data showed. Shares of IL&FS Transportation Networks Ltd and IL&FS Engineering and Construction Company Ltd locked in lower circuit after falling almost 9.9%. The shares fell after parent company Infrastructure Leasing & Financial Services on Monday said it was unable to service obligations for inter corporate deposit due October 8. ILFT stock is down 67.3% this year as of last close, while ILFE has lost 58.6% during the same period. Civil engineering firm JMC Projects on Tuesday said it had secured orders worth Rs 514 crore in the domestic market. The company said it has received two orders totalling Rs 236 crore for construction of educational institutes in Andhra Pradesh, JMC Projects said in a regulatory filing. It has also won civil construction and related mechanical, electrical, plumbing (MEP) works for residential building in Telangana for Rs 141 crore and civil works for a steel plant in Odisha for Rs 137 crore. JMC Projects (India) is an arm of Kalpataru Power Transmission. Shares of JMC Projects were trading 2.71% higher at Rs 73.90 per share on the BSE. Most auto sector stocks declined in trade on Tuesday, with shares of Tata Motors and Tata Motors DVR taking the worst hit. Tata Motors fell nearly 14% to a low of Rs 182.65 on the NSE. Eicher Motors (-4.11%), TVS Motors (-2.25%), Bharat Forge (-1.96%), Bajaj Auto (-1.57%) and Maruti Suzuki (-1.13%) were the other losers on the Nifty Auto index. The BSE Sensex extended losses during the mid-morning trade deals and traded 84.16 points or 0.24% lower at 34,390.22 points. Tata Motors shares cracked nearly 12% on the BSE. IT stocks slipped after the Indian rupee made a cautious recovery of 18 paise to 73.88 against the US dollar in early morning trade on Tuesday. 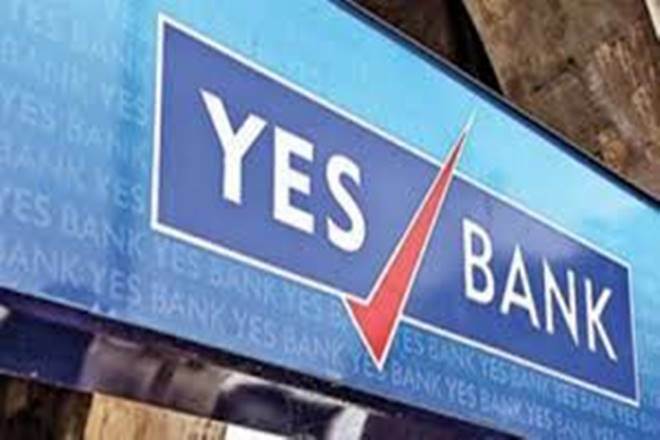 Shares of private sector lender Yes Bank gained 5.77% to a high of Rs 233.55 per share on the BSE. Yes Bank shares continued to gain for the second consecutive day on Tuesday. Earlier on Monday, Yes Bank shares had zoomed more than 4.2% intra-day after the bank had announced the appointment of a search committee to find Rana Kapoor’s successor. "Today USDINR likely to remain in the range of 73.72 (stretched 73.54) to 74.12 (stretched 74.34)... Too much rise in U.S. Treasury bond yields is causing a concern for U.S. equity markets (10Y yield at 3.246%). A risk aversion leading to a rise in Japanese Yen. Dollar Index is currently at 95.74 and is also relatively low due to European political events where Italian Deputy PM speaking at a conference alongwith Far-right French leader Ms.Marine Le Pen, denounced the European Commission President and Economics Commissioner... Chinese Yuan has declined to 6.92 against USD. DOW closed up 39points, whereas Asian markets of Nikkei & HangSeng are mixed with -282 & +54 pts respectively, Japanese markets are almost correlated to Yen moves (if it appreciates, equities decline and vice-versa). Indian equity markets had both-way swings yesterday, even with Cash-Fx market being closed (due to U.S. holiday). SGX Nifty Fut is +14pts, at the backdrop of stable Crude prices - Brent has again risen to $84.27 per barrel due to fall in Iran Oil exports. Rupee will continue to be influenced by Crude, Dollar, Yields, Yuan and Flows." DHFL shares were the most traded stocks by volume on the NSE in the first half hour of trade on Tuesday. DHFL was followed by Yes Bank, JP Associates, RCom and Tata Motors. Asian shares hit 17-month lows on Tuesday as China allowed its currency to slip past a psychological bulwark amid sharp losses in domestic share markets, a shift that pressured other emerging currencies to depreciate to stay competitive, said a Reuters report. The IMF added to the malaise by cutting forecasts of global growth for both this year and next, including downgrades to the outlook for the United States, China and Europe. Shares of automaker Tata Motors cracked over 5% to hit an intra-day low of Rs 200.80 per share on the BSE in early morning trade deals. The auto major's shares declined a day after Tata Motors-owned Jaguar Land Rover (JLR) reported 12.3% decline in global sales at 57,114 units in September, hit by lower demand in China. The rupee made a cautious recovery of 18 paise to 73.88 against the US dollar Tuesday on fresh selling of the American currency by banks and exporters. Besides, the dollar's overseas weakness, easing global crude oil price and higher opening in the domestic stock market supported recovery in the domestic unit, PTI reported quoting traders. 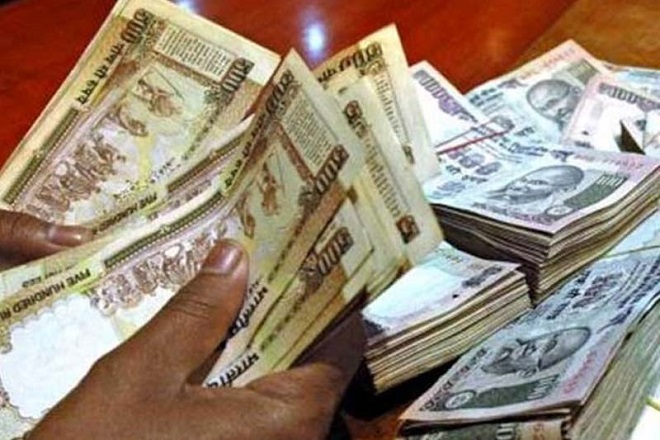 At the forex market, the local currency was trading 18 paise higher at 73.88 in early trade. The BSE Sensex opened over 200 points higher on Tuesday and surged 237 points to touch an intra-day high of 34711.68 points. The Nifty of the NSE opened higher at 10,390.30 points. Tata Motors: Tata Motors-owned Jaguar Land Rover (JLR) reported 12.3% decline in global sales at 57,114 units in September, hit by lower demand in China, the auto major said on Monday. The company's sales in China declined by 46.2% during September as compared to the same month last year as ongoing market uncertainty resulting from import duty changes and continued trade tensions held back consumer demand. NBCC: State-owned NBCC has bagged a contract to develop river fronts in Dehradun at an estimated cost of Rs 750 crore. In a filing to the BSE, NBCC informed that it has executed a Memorandum of Understanding (MoU) with Mussoorie Dehradun Development Authority (MDDA), Uttarakhand government, for 'River Front Development Project' on two rivers -- Rispana and Bindal -- in Dehradun for a total estimated value of Rs 750 crore as project implementing agency. Coal India: Coal India has entered into a pact with NLC India Ltd (NLCIL) to set up a joint venture for power generation. "Coal India Ltd (CIL) and NLCIL have signed a memorandum of understanding (MoU) for formation of a joint venture for solar power generation of 3,000 MW and thermal power projects of 2,000 MW capacity," CIL said in a filing to BSE. The BSE Sensex traded higher by 153.75 points or 0.45% at 34,628.13 points during the pre-open session on Tuesday. The NSE Nifty was trading at 10,348.05 points, up 31.60 points or 0.31%. The Indian rupee on Tuesday opened at 73.85 against the US dollar. The rupee had closed below the 74/$ mark for the first time yesterday. On Monday, the rupee slumped by 30 paise to finish at a fresh lifetime low of 74.07 against the US dollar, Bloomberg data showed. 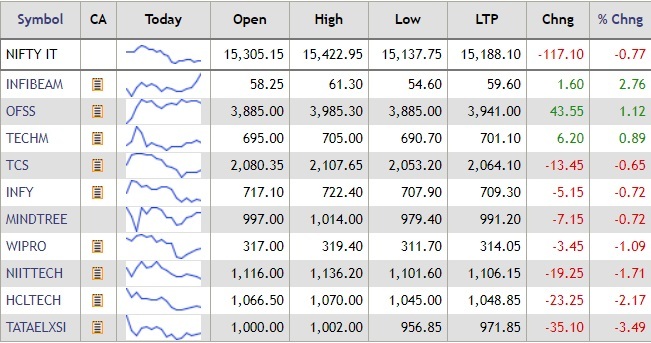 Share markets on Monday: Sensex and Nifty made a smart recovery during the last hour of trade led by gains in banks, auto and oil and gas stocks. The BSE Sensex traded within a range of over 660 points and ended 97.39 points or 0.28% higher at 34,474.38 points. The Nifty held on to the 10,300 levels and closed a tad below the 10,350-mark at 10,348.05 points, up 31.60 points or 0.31%. The rupee slumped by 30 paise to finish at a fresh lifetime low of 74.06 against the US dollar.